"My Heart rejoices in this title of Mercy. Porclaim that mercy is the greatest attribute of God. All the works of My hands are crowned with mercy. " "Jesus, I trust in you...You are burning with the desire to be loved and those in tune with the sentiments of Your Heart learn how to build the new civilization of love. A simple act of abandonment is enough to overcome the barriers of darkness and sorrow, of doubt and desperation. 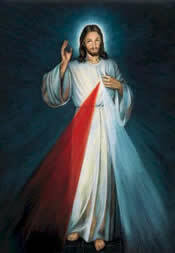 The rays of Your divine mercy restore hope."